It's a nice paper. They took NOD mice which had developed their NOD mouse version of T1DM and either treated them with insulin detemir, or didn't. They had a third group which never developed T1DM so were never treated and these served as a control group. 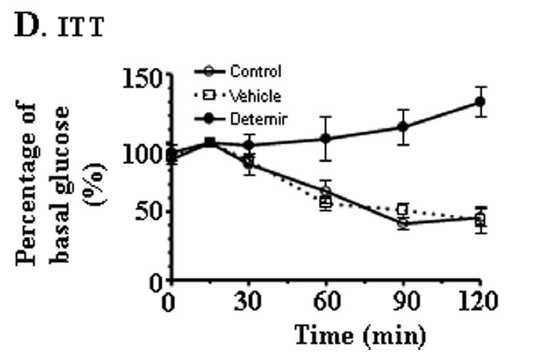 It's pretty obvious that the detemir treated mice (top line) have absolutely no response to neutral insulin and that both non-treated diabetic mice and never-diabetic mice drop their blood glucose levels by about 50% on this particular dose of neutral insulin. I could stop this post here. Exogenous insulin induces insulin resistance in T1DM mice, as it does in people. This is fact. But of course you should not just accept this. The question is: Why? 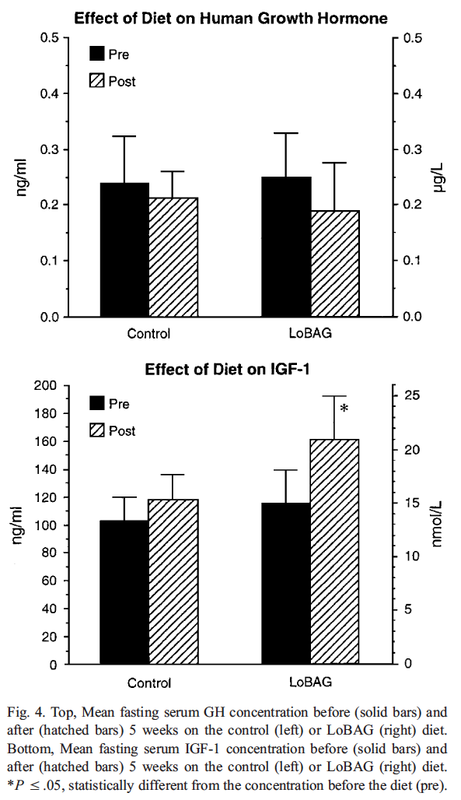 Why does "enough" insulin as secreted by the pancreas to produce normoglycaemia (in the never-diabetic control group of mice) cause no insulin resistance whereas insulin detemir given to produce the same level of normoglycaemia induces striking insulin resistance in those treated NOD mice? Recall that the hyperglycaemia in T1DM has little to do with the lack of insulin per se. The hyperglycaemia is caused by an excess of glucagon from the alpha cells of the pancreas. Insulin starts its control of hyperglycaemia by the suppression of pancreatic glucagon secretion, it's a local action within the islets. How high this concentration of insulin is under normal physiological conditions is quite hard to determine but it is likely to be a lot higher than the diluted insulin concentration in the portal vein, heading towards the liver. Now look at it from recipient cell's point of view. Glucagon is high, hepatic glucose output is high and this continuous supply of glucose is being allowed in to systemic cells by the exogenous insulin. To these cells the glucose supply looks like a meal being digested (high glucose, high insulin). The cells rapidly realise that they have enough calories (High NADH levels, high mitochondrial delta psi, reduced electron transport chain). They don't want any more. Their solution: insulin-induced insulin resistance (ie reverse electron transport to generate H2O2 at complex I and so inactivate insulin signalling). So the very effective control of blood glucose in these NOD mice is at the cost of continuous exposure to supraphysiological insulin levels coupled with a supraphysiological glucose supply, because the systemic cells are "covering for" the failure to replicate the normal gradient from islet to liver to systemic circulation. Exogenous insulin can never be physiological. I would never suggest that exogenous insulin has no effect on pancreatic glucagon secretion or elicits no suppression of hepatic glucose output. It will always have some effect, but there will always be an abnormal emphasis of its effect on systemic tissues. This is the situation in NOD mice and T1DM people. They become insulin resistant by simply using exogenous insulin to ensure normoglycaemia. I guess the next question, which was asked by the same group whose paper we've just been looking at, is whether simply injecting exogenous insulin in to normal mice induces insulin resistance. That's the next paper, in the next post. Spoiler: Of course it does.